Bangalore: Cranes Software, a Bangalore-based scientific and engineering solutions company, in collaboration with Indian Institute of Science (IISc) has set up a MEMS (Micro-Electro-mechanical Systems) research lab in the IISc campus. Christened CranesSci MEMS Lab, it has the objective of conducting research in MEMS technology and developing design for MEMS based devices with a range of applications. Set up with an investment of Rs 3 crore, the Lab has nine researchers on board currently. "The Lab will be a resource center and will encourage researchers from other institutes and companies to come and participate in the devment and testing activities," says Dr. Rudra Pratap, Assistant Professor Mechanical Engineering Department of IISc. The Lab is currently working on MEMS sensors for acoustic applications and ultrasound imaging, besides developing analysis tools and software for the specific needs of the engineers working in this area. 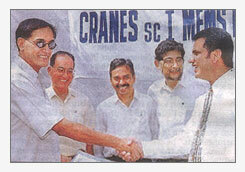 The MEMS Lab also drives the mandate of creating IPRS (Intellectual Property Rights) in the area of MEMS which will be shared between Cranes Software and IISc. Eventually, the Lab will come out with the MEMS chips, for which it is talking to several foundries and chip fabrication companies in Singapore and Switzerland. Simply put, MEMS refers to a batch of fabricated sensing and actuation systems that integrate the mechanical and electronic components on the same chip at micro and nano scales. According to Rudra Pratap, MEMS devices at the atomic size promise to create large-scale electronic storage devices that are beyond the common scientific perception. He comments: "while the race for MEMS technological innovations are intensifying all over the world, in India, we do not have a well-coordinated and planned activity in this area. Therefore, it is imperative to foster strong ties with the professional organisations right from the beginning to steer MEMS related work".